Tick tock: In Amazon’s relentless pursuit for complete control over your household, they’ve created the diabolical Echo Wall Clock, another device meant for spying on your children – wait what? It doesn’t have a microphone or camera? Then what does it do? First announced in September, the Clock has built up a surprising amount of excitement amongst Echo fans, largely due to its attractive $30 price point. Even without connecting it to the internet it’s still a good looking 10” clock, making the many added features a real bonus. Once it’s paired with another Echo device it’ll connect to the internet and set the time itself. Its ability to check if it’s running fast or slow or adjust to daylight saving time is pretty appealing, saving you the hassle of pulling a clock off the wall and awkwardly adjusting it yourself. Its primary feature, however, is the ability to visually display and manage multiple timers, countdowns and alarms all at once. Just beneath the white perimeter of the Clock is a circle of 60 white LEDs, each of which lines up with a minute on the clock. When you set a timer, each LED will light up as time passes. When a countdown’s set it will light up the LEDs then turn them off one by one, and if a timer’s on then the corresponding LED will be lit until an alarm goes off on the paired Echo. While your phone or even Alexa herself can do all these things, there’s something surprisingly pleasant about a visual interface. Whether it’s reminding the kids (or yourself) that they’ve been playing Xbox for too long or reminding you that you can finish work in 15, a visual display on the wall may be less stressful than compulsively checking a phone or listening out for an alarm. What made Amazon’s original Echo groundbreaking was the way it unlocked a new way to interact with the internet in your living room (on the cheap, too). 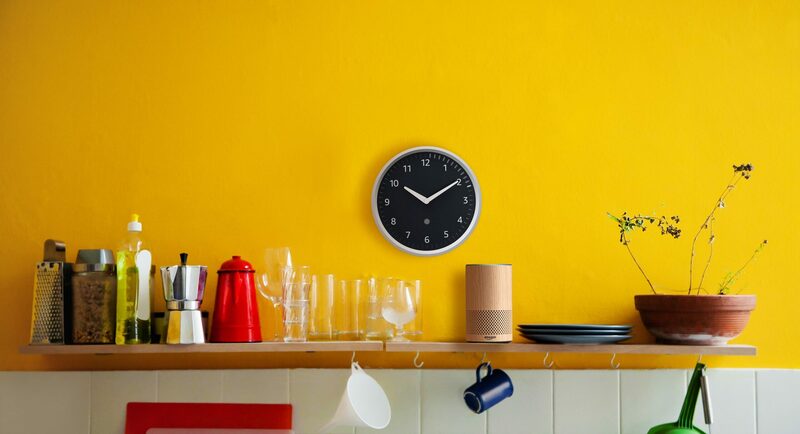 And while those kind of devices are certainly part of the Internet of Things, the Echo Wall Clock is a good example of a first generation device that embodies what IoT was always imagined to be: a standard object that adds a little bit of functionality through a connection to the internet, at no additional cost to the user.